OUR SHIPPING CHARGE IS $19.95. SHIPPING SURCHARGES APPLY TO Alaska and Hawaii. DISCOUNT CODES DO NOT APPLY ON GUN SALES. MUST SHIP TO FFL. NO LOCAL PICKUPS. PLACE YOUR ORDER ONLINE AND EMAIL US A COPY OF YOUR FFL's LICENSE. Historic CZ-82 9x18 caliber semi-automatic pistol used by Czech police/military. Comes with 1 - 12rd mag, and used holster. Black polycoat finish with plastic grips. Very heavy duty and accurate pistol. Has polygonal rifling for long barrel life (rifling not visible). Surplus GOOD condition. Condition rating provided by the importer Century ARMS. One of the most modern C & R Eligible firearms available. The CZ-82 was manufactured by the Czechoslovak firm Česká zbrojovka, replaced the 7.62×25mm Tokarev CZ-52 pistol in Czechoslovak military service in 1983. It is a compact, single/double-action, semi-automatic pistol with a conventional blowback action. This type of action allows the barrel to remain solidly fixed to the frame, resulting in improved accuracy over pistols with pivoting barrels (like the U.S. M1911 series). The low bore axis of the CZ-82 provides for less muzzle rise and quicker follow-up shots. For added convenience, both the frame-mounted thumb safety and the magazine release are ambidextrous. 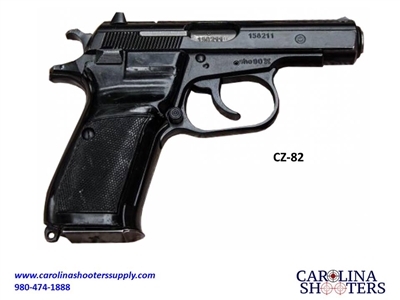 The CZ-82 was the first service pistol to feature both these features. The bore is chrome plated, which gives it three advantages: longer barrel life, resistance to rust from the use of corrosive ammunition, and ease of cleaning. Another feature of this pistol is the use of polygonal rifling in the barrel bore. This replaces the traditional lands and grooves rifling design with a rounded, smooth polygonal pattern which has a more "hills and valleys" appearance.